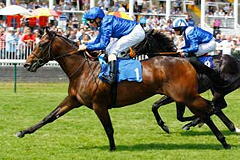 The Charlie Appleby-trained son of Shamardal had lost his unbeaten record when outfought by Mehmas in the Richmond Stakes at Goodwood on his previous start, but that experience seemed not to be lost on him in this Group Two contest. Travelling with notable ease at the halfway stage under William Buick, his rider was able to ease him into the contest from that point and he cruised clear when asked to extend. Mokarris, himself already a Listed winner, showed himself to be no slouch when getting the better of The Last Lion for second place, but neither of that pair were in the same league as the winner. Bookmakers Sky Bet cut his odds for next year's 2000 Guineas from 14/1 to 10/1, although perhaps unsurprisingly given the raw speed shown here, he's now a 6/1 chance from 12/1 for the Commonwealth Cup at Royal Ascot. Buick was completing a hat-trick, having taken the two previous races with Scottish and Wall Of Fire, and said: "That was a very good performance, he got a lead for a little bit but his cruising speed is so high it's hard to get a lead for as long as you want. "He's one of the best two-year-olds I've ridden. He's doing everything right at the moment, he's not put a foot wrong. "I can't see why an extra furlong wouldn't suit, but he has so much pace. Either way, he's very exciting." Appleby said: "That was most impressive and I think the logical thing to do is to go straight to the Middle Park, but we'll get him back home and have a chat. "At this stage he looks all speed. It would be great if he stayed a mile, but at this stage it looks like he's going to be a sprinter. "Unfortunately he learned very little in his first two runs. "Willie Ryan rides him at home and has done a great job. He's always been very impressed by him and when he likes one they are usually pretty good." Godolphin racing manager John Ferguson added: "He ran very well at Goodwood, he was beaten by a horse with a huge amount of experience. "What you want to see with these two-year-olds is real progression and that's what we saw today. "William was able to settle him and when he asked the question he showed what he is capable of. It was an impressive performance and all credit to the team for producing him like that today. He's very adaptable. "I think it's early days. During the course of the next few months we can work out where we go. Sheikh Mohammed enjoys making those decisions and you need good horses to make those decisions."